The GasAlertMicroClip XT is designed to simplify multi-gas monitoring with a combination of ease of use, durability, compliance insurance, performance and affordability. The slim and compact BW GasAlert MicroClip XT provides affordable protection from atmospheric hazards. 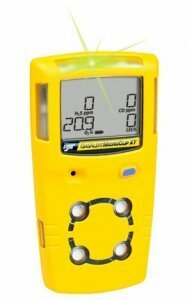 This multi-gas detector provides continuous visual confirmation of detector operation and compliance with the IntelliFlash™ feature and the simple one-button operation offers ultimate ease of use and significantly reduces time spent training. The GasAlert MicroClip XT is fully compatible with the BW MicroDock II automatic test and calibration system. IntelliFlash gives you visual confirmation, with a flashing green light at the top of the unit that is easily seen by the user and supervisors, that device is in compliance which helps increase site safety and simplifies management of your gas detector fleet. Compatible with the motorized remote sampling pump, typically needed for confined space entry to test the air in the space before sending a person into the space. Conveniently manage your ﬂeet using Fleet Manager II: Automatically create reports, sort, format and graph data, download and manage calibration and bump check records. Information is quickly and directly downloaded from BW's MicroDock II test and calibration system. The instrument is compact, robust, affordable and user friendly �" all the things you loved about the original but with improvements. There were 2 improvements made to this new generation, the GasAlert MicroClip XT. The first was the use of an improved performance Oxygen sensor; this eliminated the pre-mature depletions of the O2 sensor that was being seen on the original version, allowing for customers to get the full 2 year life out of each Oxygen sensor. The second improvement was the addition of BW's IntelliFlash feature, this new unit control feature helps ensure compliance with the latest standards and regulations required for bump testing and calibration. The MicroClip XT can also be used in a confined space kit. A confined space can represent a risk for the health and safety of anyone who enters, because it has restricted entrance and exit and the possibility of dangerous substances in the atmosphere. The air within the confined space should be tested from outside before entry. A trained worker should use remote probes and sampling lines with properly calibrated and maintained equipment to verify that oxygen content is within safe limits and that a hazardous atmosphere is not present. Alarm setpoints for all sensors are user adjustable. Setpoints are automatically displayed during instrument start up. Data storage and analysis has never been so simple. With the same look and feel as Fleet Manager, Fleet Manager II allows users to download information directly from BW instruments or the MicroDock II. Affordable, it is one of the lowest priced 4-gas detectors on the market. Compact and lightweight the MicroClip XT is easy to wear and its one button operation makes it easy to use in the field. It is perfectly suited for most applications where continuous monitoring of H2S, CO, Oxygen and Combustible gases is required. In this newest version, the Oxygen sensor has been replaced with a more reliable sensor, stopping the premature deaths seen in previous legacy versions. The unit has a rechargeable battery, which has a long life span. But because the battery is fused to the unit's main PCB board it can only be replaced at the factory and some authorized service centers. So the swapping out of batteries in the field is not possible. The battery also has had minor problems in cold temperatures, in -20°C temperatures the battery run time is reduced considerably, some users report only getting a 5 hour charge when in this kind of cold. At a very affordable price, the MicroClip XT is ideal for many applications, and is easy to use and maintain. A popular unit, the GasAlert MicroClip XT is a decent choice for anyone wanting continuous protection in an inexpensive 4-gas detector. It is a good fit in virtually any application where toxic and combustible gases are a concern, such as Oil & Gas, Utilities, Municipalities, Refineries, Steel Mills, Pulp, Paper and more. Previous issues with the Oxygen sensor in the legacy version of the MicroClip (model number beginning with MC-) caused a lot of concern a couple years ago as the Oxygen sensor used at that time was unreliable and would die after only a few months of use. The manufacturer discontinued that legacy model and replaced it with this new version; the MicroClip XT (model number begins with MC2-) has a different and highly reliable Oxygen sensor in it. The issues have been resolved in this new version and the confidence of users in the field is beginning to return. Regular maintenance is required on this model in the form of frequent Calibrations. Bump Tests can also be performed on the unit depending on personal preference or site safety regulations. The built-in concussion proof boot provides excellent protection against accidental bumps, scratches and damage; and it is water-proof, with an IP rating of 67 it can be submerged in water up to 1 m deep for 30 minutes. The real-time gas concentration is displayed continuously on the LCD so you will always know the current levels, even when the unit is not in alarm. The unit has a built in Datalogging feature, enabling you to retrieve a detailed and accurate history of conditions and unit maintenance if needed. Calibrating the unit is required every 180 days by factory default but is quick and easy to perform; the procedure can be done in the field and only takes about 2 minutes to perform, and all you will require is a cylinder of calibration gas and a regulator. It is also compatible with the BW MicroDock II calibration and bump test station for those who wish to use a more hands-free, automated, calibration and bump test procedure.